Nearly half a century ago on the quail rich acres of the Bell estate in Alabama, the colorful career of the brilliant Free-for-All Championship was launched. 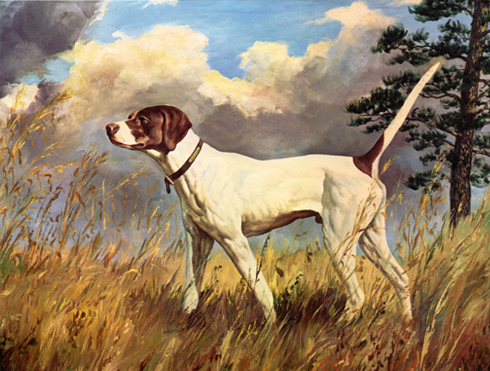 What bird dog history has been made in this great stake! What stellar pointers and setters have won the title; what sensational performances have been witnessed! It is only fitting that special tribute be paid to John Proctor, the first of many great dogs that have captured the National Field Trial Club’s Free-for-All crown. While field trial history is replete with great performances made in many titular events throughout the United States and Canada, it is the National Championship run at Grand Junction, Tenn., and the Free-for-All that have become the real plums of major circuit competition, and are the only endurance tests with maximum three-hour heats. In the Free-for-All, all dogs run a one hour qualifying series to be eligible to run in the three-hour championship heats. In the National Championship, all entrants must go the three-hour route. Admittedly the National Championship is the acknowledged gun dog supreme. The Free-for-All Championship, on the other hand, might well be called the field trial dog supreme, for in the Free-for-All a dog is called upon to deliver a race that ofttimes demands range, speed, and drive that borders on the impractical. As regards manners, the National Champion is expected to remain ever subservient to the gun; while the Free-for-All Champion often displays only enough handling response to prove an adaptable temperament. That many dogs have won both events…some on several occasions…points up the fact that the two stakes do not really look for different type dogs, but rather different type races. The Free-for-All since 1916 has been offered in an uninterrupted series. 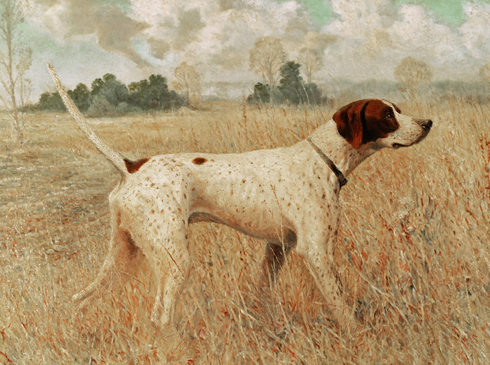 This classic quail event has added many interesting and exciting chapters to bird dog history. Free-for-All champions, by and large, have significant field trial records — most have won other important events. Some of the greatest races ever run in field trials are part of the National Field Trial Club’s Free-for-All history. Clouds threatened as an entourage of nearly fifty horsemen followed two leashed pointers to an imaginary starting line on the N. J. Bell estate near Calhoun, Ala. Open lands stretched away in all directions, providing ample opportunity for the dogs to make an impressive breakaway. The time was 8:55, Tuesday morning, January 17. The event was the National Field Trial Club’s inaugural running of the Free-for-All Championship. 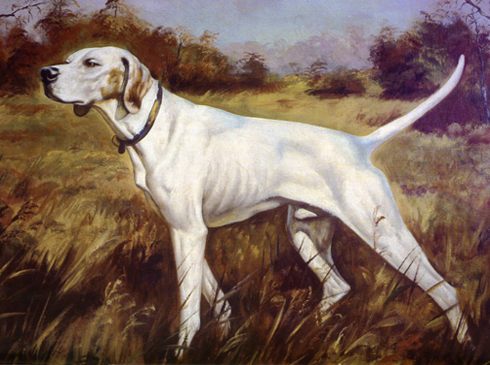 John Proctor, a lanky white and lemon pointer dog, by Fishel’s Frank ex Miss Mariutch, stood steady while his half brother, De Soto Frank, by Fishel’s Frank ex Alford’s John’s Fancy, was brought into position. Both dogs had qualified in a one-hour heat on the previous day and were now down in the championship finals, featuring three-hour heats for the Free-for-All crown. And this was nothing short of the truth. On Friday previous, John had run a three-hour heat at the National Championship at Grand Junction. On Saturday he was called back and ran a two-hour second series that gained him the title of National Champion. On Sunday he was loaded into a crate and hauled from Grand Junction, Tenn., to Calhoun, Ala. On Monday he was jolted over muddy, bottomless roads, and put down to run a one-hour qualifying series. On Tuesday he was brought back to the starting line to run a grueling three hours in the Free-for-All finals. Talk about “iron dogs”! It was announced before the trial that this would be John’s last public appearance, and many sportsmen were in the gallery to see John close out his books on a memorable career. And close them he did with a pulse-stirring duel with De Soto Frank that is remembered even today. “Turn ’em loose,’ came the order. John broke fast, and on top, with a wide cast that carried him far to the front. Turned in this forward drive, John swung back on a reverse course and sailed far to the right where he crossed a gully and slammed into a staunch point. His birds were accurately located, dead ahead, and he was steady throughout. De Soto Frank, working ahead, made a find with intense style. John moved out wide and fast now, and his handler was under pressure to keep tabs on his dog. In tall sedge John stacked up on another find. 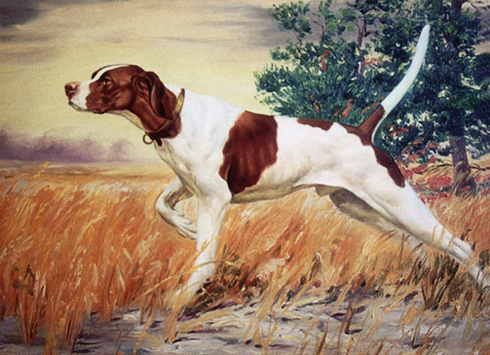 Frank sailed in and backed intensely, both dogs remaining steady as Babcock flushed, fired, and downed a bird. John moved out and pointed a single, manners perfect. Frank now seemed to hit his stride and opened up, driving hard and fast. Ahead Frank flashed into a point, roaded to his birds, and then paused on a crest of a rise, remaining steady to wing and shot. In a thicket ahead Frank threw down on another covey with perfect manners. At the hour mark both dogs, side-by-side raced through a cotton field in full view of the gallery with neither showing any evidence that the first sixty minutes had taken anything out of them. At the far edge of a field John pointed. Frank drove in from the opposite direction, a bird flushing between them. It was John’s point and his bird. Moving out, both dogs were soon found on point on a grassy knoll, each holding independently of the other, both mannerly to wing and shot. Racing down a knoll John pointed a single; steady. He moved out and hit another; steady. Ahead John pointed, but this time on a running bird that flushed as he was roading to it. Now both dogs pointed dead ahead in burnt sedge strip. Larks fluttered up around the dogs, but both remained poised and steady to the flush of a large covey. At the end of two hours John was running smoothly. Frank, equally ambitious, was a mere speck on the far timberline. John pointed to one side and had a covey perfectly located, manners beyond reproach. John was being swung back to the center of the course, after making an extremely wide cast, when point was again called by Babcock. It was a long ride to where John stood. As judge dismounted to cross a fence, birds flushed. This point was held a lengthy time, with John mannerly throughout. Frank now drove forward and pointed with polished manners. Moving out, Frank connected again, and had another covey perfectly located. As the three-hour heat dwindled to less than thirty minutes running time remaining, the first hint of weariness could be detected in De Soto Frank’s drive. His great race and bird finding effort were recognized by all, but the blustering pace had taken its toll. There was no quitting but Frank was now running on nerve. John, still traveling wide, made another find and was steady. In the last few minutes of the race both dogs came together on a section of open ground that lay directly ahead of the gallery. Each dog seemingly flung a challenge to the other, and both starred in a finale that stirred the heart of every sportsman there. John was apparently not tired, and as for the valiant De Soto Frank, he simply had no quit in him. To the last second’s tick John Proctor relentlessly drove forward, fighting off Frank’s effort to gain the lead. What a finish! No champion ever said goodbye more gloriously than John, nor fought off a more worthy opponent. John Proctor was whelped on June 17, 1910, and was bred by his owner, A. L. Curtis. 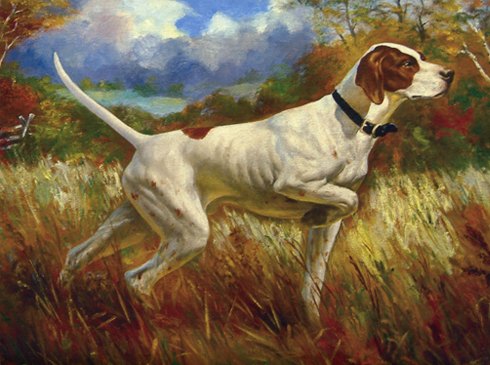 John’s sire, Fishel’s Frank, was of course a fountainhead of pointer breeding. His dam, Miss Mariutch, was daughter of the celebrated Alford’s John ex Blanch Proctor. It was said that this combination of Fishel’s Frank to Alford’s John blood put the pointer on par with the setters. At any rate the pointers have dominated on all except four occasions since 1916, and the record shows than John Proctor’s descendants gained more than their full share of glory in this important event. Beginning with John Proctor’s first placement, a second in the Continental Derby of 1911, John had four years of competition. 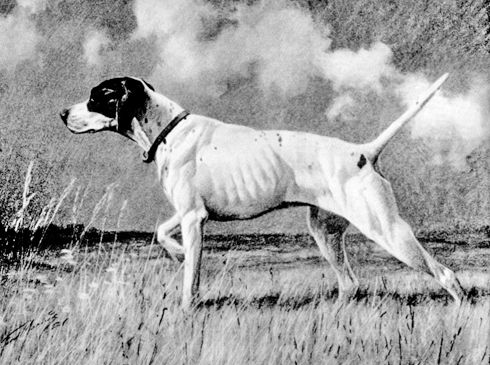 He placed in all 23 times, winning every great place in field trials that a dog could win, with the exception of the American Field Quail Futurity, for which he was not eligible. He met all the greatest dogs of his day — and there were some great ones— but they all, at one time or another, bowed to him in defeat. John ran some poor races, poor for John Proctor that is, but at the time of retirement he held more placements in recognized field trials than any dog up to that time. In less than one week he won both the National Championship and the Free-for-All! John Proctor sired Ferris’ Jake, the 1921 National Champion, and Jake in turn sired Muscle Shoals’ Jake, winner of the Free-for-All in 1923 and 1924. Muscle Shoals’ Jake sired Air Pilot, which in turn sired the 1936 and 1939 Free-for-All Champion, Air Pilot’s Sam. Air Pilot’s Sam sired Ariel, winner of the 1944 and 1945 Free-for-All Championship in his six title acquisitions. John Proctor not only won the inaugural Free-for-All with a truly brilliant performance, but passed on his great natural abilities to his offspring. John was elected to the Hall of Fame in 1954, the first year of voting, along with his sire, Fishel’s Frank and grandson, Muscle Shoals’ Jake. Since then a great-grandson and a great-great-grandson have joined him on the honor scroll. 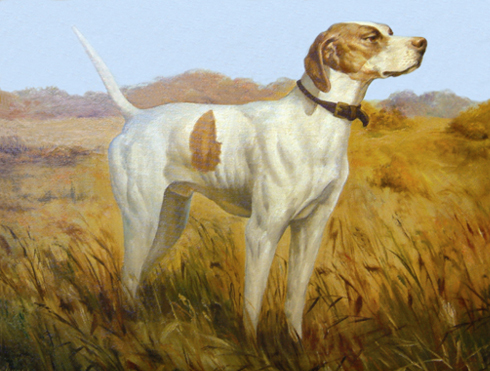 It was indeed proper and fitting that the great John Proctor, destined for immortality, should have won the National Free-for-All inaugural and thus head the list of bird dog celebrities that have gained that proud title. John was often referred to as a “first place or nothing” dog. The implication is clear—that he tops a stake or isn’t even in the money, a performer of the type that is seldom placed second or third. When John Proctor won, his race was recounted in glowing terms; when he lost, he was damned just as soundly. Most pointers competing today trace back to John Proctor including those from the Miller line through Riggins White Knight and the Elhew line through Lexington Jake.